JINHO Movas Electro Static High Potential Therapy from Japan – Kenkoya | Your total health solutions! 100% made in Japan and fully imported from Japan, JINHO Movas is one of the latest and more advanced electro static high potential therapy machine. For old model electrostatic therapy machines or others brand, as the number of users at one time increases (strain 1) or when using inadequate insulation (strain 2), the healthy electrostatic waves being emitted will be reduced and ultimately affect the therapy effectiveness. However, JINHO MOVAS with its unique OVA system has the ability to stabilize the healthy electrostatic wave emission to a suitable level for our body (9,000V) regardless of any possible strains. This ensures that the therapy’s effectiveness will be at an optimum level, which is the OVA therapy generating at 100% effectiveness. The OVA demonstrates that as the strain increases, the lighted boxes (total of 5 boxes) will gradually increase to restore any leakage of healthy electrostatic waves. Considering the fact that the OVA system has a safety circuit, other than increasing the machine’s performance and stabilizing the healthy electrostatic wave output, if the strain level reaches maximum tolerance, the therapy in session will be automatically stopped. 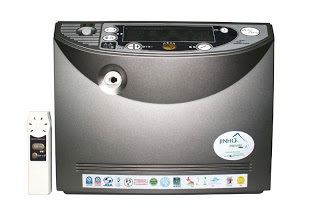 JINHO MOVAS is a one-of-a-kind electrostatic therapy machine on the market that offers 100% negative ion therapy. It is extremely suitable for usage by today’s people, who experience a lot of negative ion loss and suffer from chronic diseases. Based on the condition of the user at that time, he or she has the option to select from 3 different types of negative ion output programmed (-50% / -75% / -100%). Acidic blood is one of the main causes of chronic diseases. JINHO MOVAS full body therapy is capable of cleansing the blood, improving the condition of the body, and also eliminating the causes of illness. There are 21 different types of choices, consisting of 7 different combinations for each of the 3000V, 6000V, 9000V voltages, and each A, B, C, D, programs respectively, and multiplying with the 3 percentages of negative ion outputs, -50%/-75%/-100%. These distinct programs will prevent our body from immunizing itself against the benefits of the machine (drug tolerance). Provides long-term treatment on a low voltage. Able to improve blood circulation and reduce the toxic levels in the blood. Very suitable for those living hectic lives and those suffering from chronic diseases to “gain health during sleep”. There are 3 possible choices in one combination for the low 800V voltage selection, i.e. the percentages of negative ion output, -50%/-70%/-100%. The Electronic Pen (pointer and roller) provides treatment for certain body parts that get easily tired such as the neck, waist and shoulders. The pointer focuses on small gaps and acupuncture points, while the roller focuses on treating a specific painful area. There are 6 possible choices separated in 2 different combinations for the 800V and 1500V voltages, which are the percentages of negative ion output, -50%-70%/-100%. The blood of a healthy person ranges between the pH levels of 7.35 to 7.45 – giving it a slightly alkaline property. However, as the blood turns acidic, blood flow will be less smooth and some biochemical reactions in the body cannot function properly. Therefore, using JINHO MOVAS in the long run will help to gradually switch its properties back to its alkaline state thereby increasing blood flow and maintaining stability of the human body’s biochemical reactions. JINHO MOVAS is capable of generating vibrations of 50 times per second. This means that the body cells are able to be stimulated at 50 times per second. This function can help improve the cells’ vitality and permeability and help improve metabolism. Immunoglobulin (Ig) is a natural antibody that resists infection. JINHO MOVAS can increase the number of immunoglobulin in our blood; therefore indirectly improving the immune system. The involuntary nervous system is part of the peripheral nervous system which functions largely below the level of consciousness and controls the internal organs. When people are under stress, the involuntary nervous system functions go haywire. As a result, insomnia, constipation, frequent urination, palpitations (irregular or fast heartbeat), diseases infecting the digestive system and many others start popping up. Through JINHO MOVAS, the involuntary nervous system can be recalibrated back to the normal levels of the healthy human body.